For more than three decades, Copenhagen- based Danielsen has used BIM to create their New Nordic Functionalism, which places Danielsen among the BIM pioneers in the Nordic region. In recent years, their employment of Solibri throughout the workflow have secured their project managers a good night’s sleep. Danielsen was founded in 1987 by Kasper Danielsen, and today the company has more than 70 multi-disciplinary employees who work in Danielsen’s self-designed headquarters in Copenhagen and in their Stockholm office.Danielsen is actually three companies in one; Danielsen Architecture (1987) creates functionalist architecture, Danielsen Space Planning (2001) advises companies on interior design and design matters, while Danielsen Urban Landscape (2015) develops and forms landscape architecture. Kasper Danielsen, founder and CEO, explains why he gathered three companies under the Danielsen name tag. “Architecture is more than buildings. We believe that good architecture is functional and context-based design, which includes buildings, interior spaces and landscapes. That’s the reason why we are three companies in the Danielsen family”. Comprehensive analytical work for each project, along with respectful partnerships and collaborations with contractors, users, and engineers is an integrated part of Danielsen’s approach for creating sustainable and value-adding architecture. This open and dialogue-based approach means that every project is carried out with numerous stakeholders, making the need for quality assurance, collision control and communication across various disciplines a key issue in every project. That is one of the reasons why Danielsen has used ARCHICAD since the first project back in 1987, and further on added Solibiri to their BIM workflow. For Danielsen it simply represents the most functional and value-adding way of working. The highly digitalized workflow is also employed in the Myrholm project, which is currently under construction at Enghave Brygge, a new quarter being raised at a former industrial district of Copenhagen. 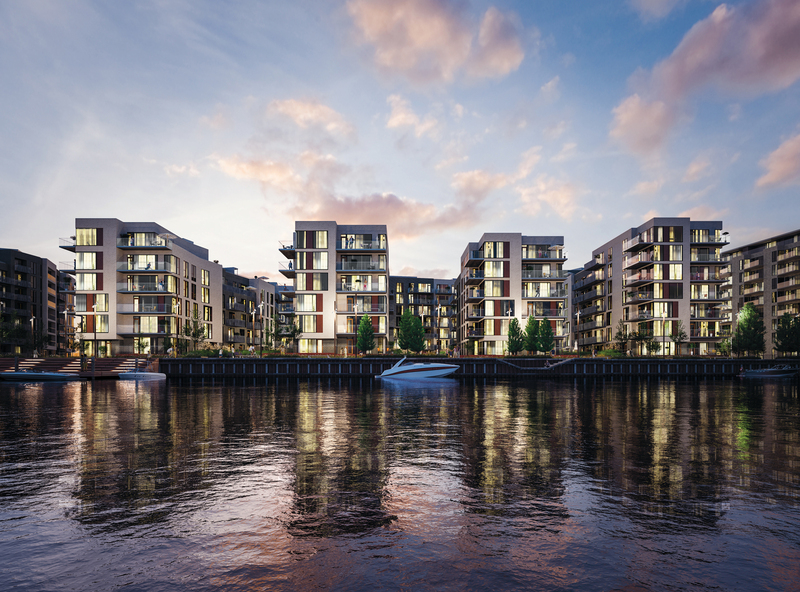 Myrholm is being developed as a new canal district and will become the latest addition to the ongoing development of Copenhagen’s waterfront. Danielsen Architectural’s contribution to Myrholm consists of a classic Copenhagen block structure with a new, light, Nordic twist. Based on the idea of New Nordic Functionalism, the buildings are created with the functionality and usability of the apartments as a high priority. Kasper Danielsen explains how Myrholm is the perfect example of New Nordic Functionalism. With more than 21.000 square meters, Myrholm is a large building project that showcases some of the characteristics of Danielsen’s Nordic approach. Deep daylight intrudes every home, and the simple, modern facades are constructed with light yet durable materials. In addition the surroundings are integrated together with Danielsen Landscape, securing that residents and visitors can enjoy the urban life of the canals and the harbour. Nadeen El Erkessousi is a construction architect MAK at Danielsen Architecture and a part of the Myrholm team. In a large housing project like Myrholm, it is vital that quality assurance and collision control is made easy, so the team can avoid any unpleasant surprises once the contractors start working on the site. Architects have always had a strong focus on quality: quality of their design, the materials used and the collaboration in the building process. With large, complex buildings, and with all the demands of a modern building project, it is important to have the right technology and the right processes to ensure all parties are working towards a common goal from when the first 3D models are exchanged to the when contractors leave the building site. “With the pressing demands of quality assurance and clash detection, Solibri Model Checker was an obvious choice when deciding on which program to use. We use it both internally to check our own work and as a clash detection tool with our engineers’ models.” Nadeen El Erkessousi explains. “The feeling of delivering a model to our engineers, knowing that the model has been thoroughly checked both by us and Solibri does give me a sense of confidence. There is just something about uniting all the models from the engineers with ours that makes the project feel whole and almost tangible”. Nadeen El Erkessousi also points out that using Solibri results in fewer issues that have to be solved during construction, which obviously has a positive impact on the building costs. “When checking the models against each other, we are not only keeping an eye out for the obvious clashes but also being aware of possible conflicts that may occur throughout the projects construction, which inevitably would result in fewer issues on site and costs.” Danielsen are using Solibri Model Checker in all three departments. “The options of optimizing each check has further encouraged us to incorporate it into all three companies, despite it being most valuable in the architecture and Space Planning departments. Danielsen’s use of the ARCHICAD and Solibri Model Checker is a good example of how technology and a user-orientated, functional approach to the built environment go hand in hand.